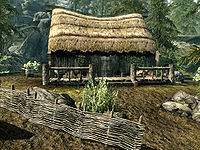 Faendal's House is a small home in the southern part of Riverwood, located behind Sven and Hilde's House and across from Hod and Gerdur's House. It is the home of Faendal, a local hunter and lumber mill worker. It consists of one zone, Faendal's House. There is only one room to the house and it is crammed with items. Starting to the right and moving counter-clockwise, there is a small dining table with two chairs, followed by a single bed, a non-respawning end table and a non-respawning cupboard, and then the fireplace. Next is a food table with a bench, then a respawning food barrel and an armor table, and finally another non-respawning cupboard. To the right of the bed is a respawning chest and there is a cooking pot by the fire, and a small non-respawning chest under the armor table. 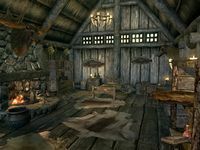 In addition to the standard stag's head above most fireplaces in Skyrim's homes, Faendal has a deer's head above his small dining table, and a slaughterfish mounted on either side of his bed. There is a troll skull by the bed, a woodcutter's axe by the fire, and on the armor table, a hunting bow, two iron arrows, an iron helmet, a leveled mace, a leveled sword, and a banded iron shield. There is a leveled war axe on the non-respawning cupboard beside this table, behind some books on the shelf with the potion of minor healing and the potion of true shot. On the shelf above that are two sabre cat pelts, and four loose iron arrows. The books on the cupboard next to the door include Killing - Before You're Killed, Scourge of the Gray Quarter, Pension of the Ancestor Moth, and Ode To The Tundrastriders. The end table beside the bed holds a copy of Herbane's Bestiary: Ice Wraiths. There are a few ingredients and a good deal of food about the house. Above the fire is a bowl of troll fat, and hanging above the food table and the cupboard by the bed are four portions of dried elves ear, three portions of dried frost mirriam, and two garlic braids. There are four rabbits and four pheasants hanging above the food table, which is set with two bottles of alto wine, a bottle of wine, a raw rabbit leg, a pheasant breast, two loaves and one piece of bread, two potatoes, one serving each of baked potatoes and grilled leeks, one serving each of salmon steak and seared slaughterfish, two chicken's eggs, and a varied selection of cheese: sliced eidar cheese, sliced goat cheese, an eidar cheese wedge, a goat cheese wedge, and a goat cheese wheel. Three more bottles each of wine and alto wine can be found, one of each on the armor table, end table, and small dining table. The small dining table also holds an additional loaf of bread. The front door has an apprentice-level lock, the key to which is carried by Faendal. The key can be freely taken from him if he becomes your follower. After completing the quest A Lovely Letter in Faendal's favor, all low value items become free to take, and the bed becomes usable. Directly behind the southwest corner of the house is a stone quarry, if Hearthfire is installed. A respawning food barrel sits on the east side of the porch, and another respawning food barrel can be found just north of the potato plants in the garden. This page was last modified on 27 September 2013, at 23:48.